STRAWBERRIES, and we think enough to keep in stock all weekend — but you can still order online if you really want to be sure (no limit this week, and just a hair lower in price). Broccoli is the new kid on the block this week, arriving late morning on Thursday. Also new: hakurei salad turnips (the marshmallows of turnips), bok choy, basil(!) and oregano, and some additional salad green variety. Asparagus is from a different farm this week and still going strong, but I imagine starting to wind down. Come celebrate with us on Friday evening from 5pm to 6pm — a champagne toast to three years at the Broad Street Market! 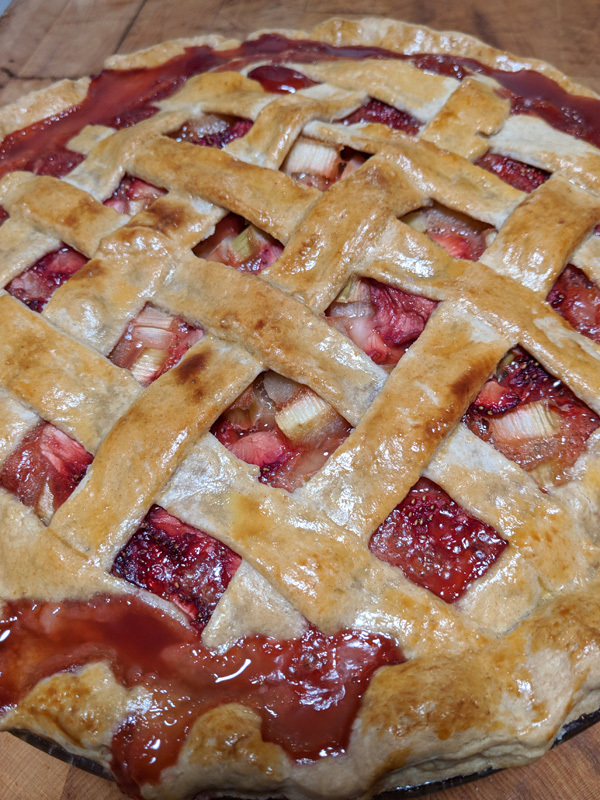 Not only did Dusty write this week’s post, he also made this incredible strawberry rhubarb pie. Dusty here. I don’t always write the Radish & Rye weekly update, but when I do, it’s going to be about the economics of our business. I hope you’ll indulge me for a moment while I talk a little bit about some of the inner workings of the business and how we think about it. Julia and I love what we’re doing at Radish & Rye, we both enjoy puzzles (even just for the sake of puzzles), and we always want to provide the best possible experience, so we’re always trying to find little tweaks to the business, rolling weird little problems around in our minds, and looking for ways we can optimize whatever we can. By far, the most interesting and challenging puzzle we face is predicting what we need to have on hand to sell on any given day or week. Sales are affected by weather, traffic, the recipes the New York Times publishes that week, whimsy, and a million other things we can’t even hope to name, let alone understand. And, because most of these factors are in the future relative to when we place our orders, they are fundamentally unknowable. Add to this the fact that we’re ordering and selling perishable produce with a very finite shelf life, and you can see why we might spend so much time thinking about it. You’ve probably heard the old truism that you can have a project done well, done quickly, and done inexpensively, but you can only pick two. This is sometimes called the Triple Constraint or the Iron Triangle. The point is that relative to other products or services available in the marketplace, you generally have to give up quality to get something fast and cheap, pay more to get it fast and done well, or wait a while to get it done well at a low price. Of course, this dynamic plays out differently depending on the specific type of produce in question. For potatoes, onions, and other storage crops, it’s almost a non-issue because these items are not very perishable. At the other end of the spectrum are delicate lettuces and berries, which may only be at peak freshness for a few days, and so warrant very close attention. Of course, we WANT to be able to provide all of you with fresh, affordable produce that is always in stock (when in season, of course). We want to be your Premium/Discount/Farmers’ Market — your everything! But, because we’re committed to making the food we offer as accessible as possible (low prices) , and because we aren’t willing to compromise on quality (freshness), it is the “In Stock” point of the TPP triangle that we have come to view as the biggest flex point. That is, we mostly lean towards the Farmers’ Market Model, keeping our orders conservative, basically aiming to sell out completely by the end of the day on Saturday (but preferably not earlier in the day). Within this model, there are some strategies that we use to get as close to optimizing The Produce Predicament as possible. Mostly this means analyzing historical sales data for individual items and adjusting those quantities for current growth and any other factor we can think of; sacrificing rutabagas to the vegetable gods and praying for mercy; and reducing waste on the back end by selling items at a discount if they’re past their peak. For what it’s worth, what waste we do have is mostly eaten by us and the rest of the R&R team, so we end up composting only a very small amount of produce. It should be noted that while we’ve decided to take this approach philosophically, in reality the majority of times we do sell out of an item it’s actually because we’re unable to get the quantities we know we need from any of the farms we work with. Such was the case last week when strawberries were just starting to ripen locally, and we could only get enough to last through Thursday! Further complicating this supply issue is that South Central Pennsylvania fruit and vegetable consumers are competing with the deep-pocketed consumers in Washington, D.C. When VERY limited quantities are available locally, the price is just too high for the Harrisburg market, and it all goes to the fat cats down south – but that’s an issue for another post. So anyway, all this is to say that if you’ve ever come to us looking for something and we were sold out, blame The Produce Predicament! Actually, although I think that we (just Julia actually) do a pretty great job with ordering the correct quantities, it’s still fair to blame us since we’re the ones making the decision to leave the “In Stock” point of this dilemma as our flex point – and sometimes we do just straight up get it wrong. But it’s also an economic reality that occasionally being out of stock of an item is one of the ways we’re able to keep our produce fresh and our prices low, which we have chosen as our priorities. That is, until Amazon.com invents a way to so reliably predict future consumer behavior that it makes all these little puzzles moot. In the meantime, we’re honored that you come to us for your produce (and other local food) needs. As we celebrate our 3rd anniversary at the market and begin our 4th year, we are humbled by your patronage, and grateful that Amazon hasn’t horned in on the local food market too much. We love being at market, and looking for solutions for all the conundrums it presents. On behalf of the Radish & Rye family, and the many farmers and producers your grocery dollars support, THANK YOU!